Wow, time flies! I know it sounds cliche but I really cannot believe that Jenna is already 3. This little person has impacted my life in ways I could never have dreamed or imagined and no matter how much this little person can challenge me at times, I love her and couldn't imagine life without her. When I see pictures of her only a year ago I can't believe how much she has "grown up". 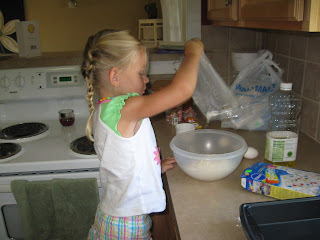 We celebrated her birthday by baking her own cake, something she loves to do. Her pick was Funfetti cake with strawberry flavored whipped frosting and lots of sprinkles...probably more yummy to kids than adults. 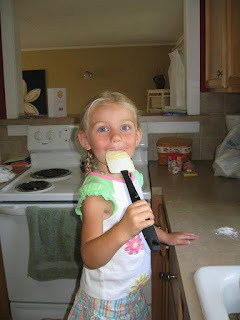 She had a ball and the best part was licking the spoon of course!